On Tuesday, March 13th 2018 Channel grantee partner Center for Women’s Global Leadership (CWGL), in partnership with Rutgers University, is hosting the launch of a report authored by Saudi women’s rights activists who seek an end to restrictive laws that position them as second-class citizens in Saudi Arabia. The report is the first of its kind where Saudi women speak for and about themselves, sharing the story of their activism to a global audience. 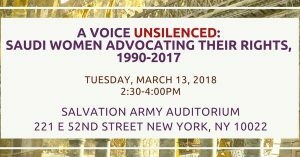 Launching the report at CSW62 will promote and amplify Saudi women’s voices and provide an opportunity for the authors to engage with other activists and the press, helping to create a space for Saudi women’s activism to go beyond Saudi Arabia. The panel will be moderated by Krishanti Dharmaraj, Executive Director, CWGL, with several Saudi activists and special guest, Yakin Ertürk, former UN Special Rapporteur on violence against women.